Welcome to Food of the Gods Smoked Salmon Gift Hampers for UK, Europe and International Delivery. Our Smoked Salmon Gift Hamper Collection contains the finest sustainable smoked salmon farmed in the pristine waters of the Outer Hebrides and a selection of the best artisan, organic and sustainably produced food and wine to create the perfect Smoked Salmon Gift Hampers. At Food of the Gods, we understand how important presentation is when it comes to gifting. 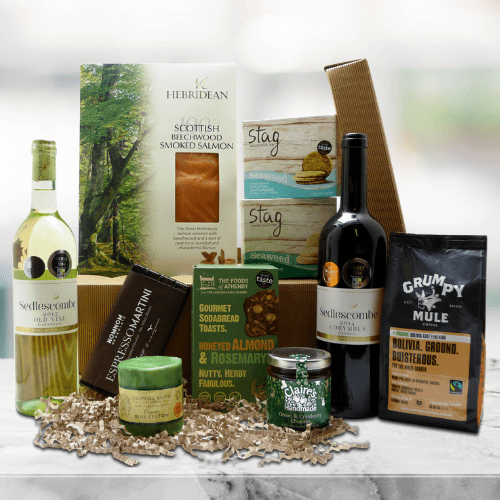 We are also aware of the impact of packaging on the environment and to that end we are committed to using sturdy, stylish and eco friendly gift boxes, sustainable baskets, hampers and recycled and recyclable packaging materials without compromising the presentation of our Smoked Salmon Gift Hampers.